Consider having your next business meeting, private reception or cooking demonstration at the Irondequoit Conference Center. Call Leah Riley, our Events Manager at (585) 266-1068 x 203 to start planning your event! 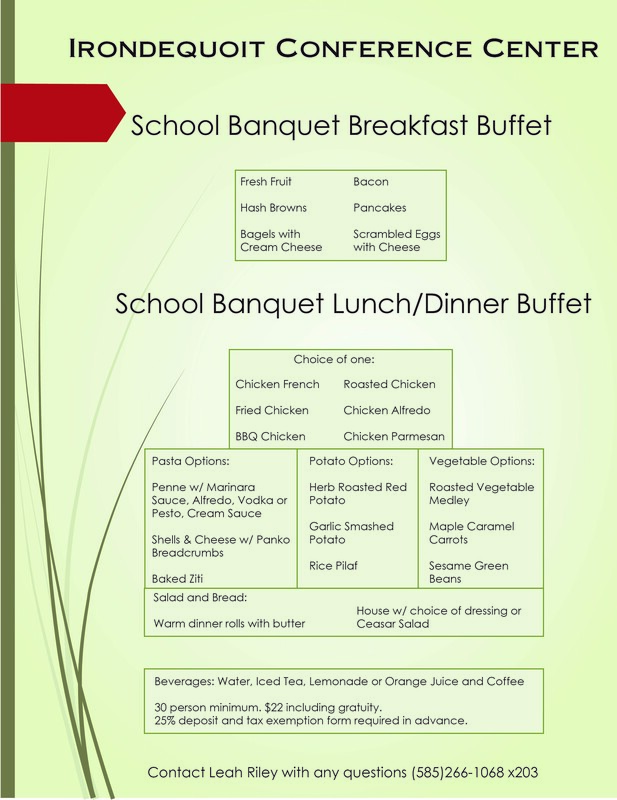 Various Buffet, Brunch and Cocktail Party Menu options available here. We now offer Catering to go for your next gathering. Menus and Pricing here. Call Leah Riley at 266-1068 x203 to place your order. If you would like to find out how we can provide you with the perfect setting for your next event, please call Leah Riley, our Events Manager at (585) 266-1068 x 203 or click on the button below and complete the form and we will contact you as soon as possible. Thank you for considering The Irondequoit Conference Center.